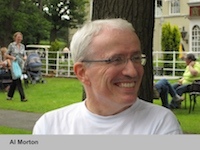 Al Morton is a Lead Member of Technical Staff at AT&T Labs, Middletown, New Jersey. He has been a chairman and recognized contributor in US and International network performance standards committees for more than 25 years. He authored or co-authored more than 31 IETF RFCs, and is a committer on several Linux Foundation projects. He has worked at Bell Labs, the U.S. Army Satellite Communications Agency, and Computer Sciences Corporation. Al spends his spare time making and enjoying music with friends and family on the New Jersey Shore, Chicago, Illinois, and wherever his travels take him.